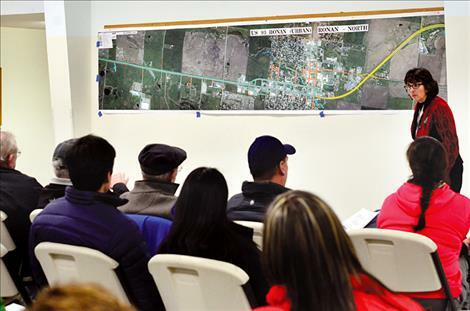 Kathy Harris, transportation project manager at KLJ, describes the highway expansion project to community members. 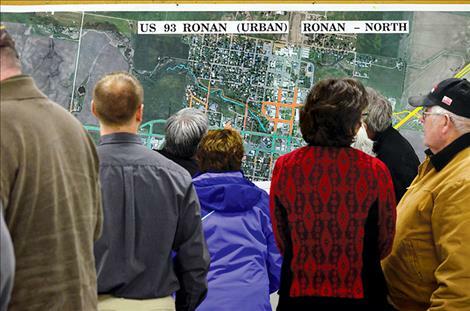 Highway Construction begins on the north side of Ronan in 2018 to expand the road, put in a stoplight, trail system, and close Spring Creek Road. 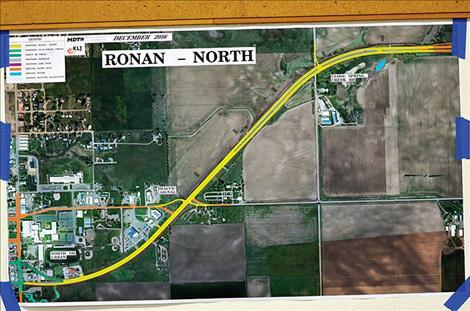 RONAN – Construction on a one-mile section of U.S. Highway 93, going north of Ronan, starting at Round Butte Road, is set to begin in 2018 to accommodate growing traffic. “There will be two lanes of travel in each direction and much of it has a turn lane in the center,” said Kathy Harris, transportation project manager at KLJ. She is managing the design plans on U.S. Highway 93 for the Montana Department of Transportation. Harris spoke at a town meeting on Tuesday, Dec 6, to inform the public about changes with the road construction project. She said plans were developed with input from government officials with the Ronan City Council, the State of Montana, Lake County, and the Confederated Salish and Kootenai Tribes. The original construction plan was going to include a section going south through town for another three miles along with the one-mile north side project, but funding wasn’t available to do both projects at the same time. “Funding for construction is getting used up faster and there is less of it,” she said of state funds. So, the project was divided into two phases. The north section will be completed first in 2018. A specific date hasn’t been set for the second phase going south through town but the year 2021 is a possibility, and the second phase is designed to split the highway into two sections through town from about Dairy Queen to McDonalds, similar to the couplet in Arlee. “Some homes and businesses have the potential to be bought out,” she said, to make room for the expansion. Construction on the second phase going through town will not begin for at least half a decade. Currently, the north side of the project is being developed. homes in the second phase worries him, but he thinks the construction project will help clear up the town’s need for lines on the road and pothole repairs. Rick Sinclair, owner of the Diamond S RV Park, said he hopes the construction project doesn’t damage summer business in the county, but he is positive about the new stoplight to help manage traffic. Mayor Kim Aipperspach said people have been talking about widening the road since the 1980s. He said it took years to study the road and figure out how to expand it. Ronan City Council Member Ellen Kaphammer said the bike path and the stoplight are two things the town really wanted when they talked to engineers about the designs.